For years Beatles disruptor Yoko Ono has been a habitué of the New York Times advertising pages, and yesterday she added this to her portfolio. 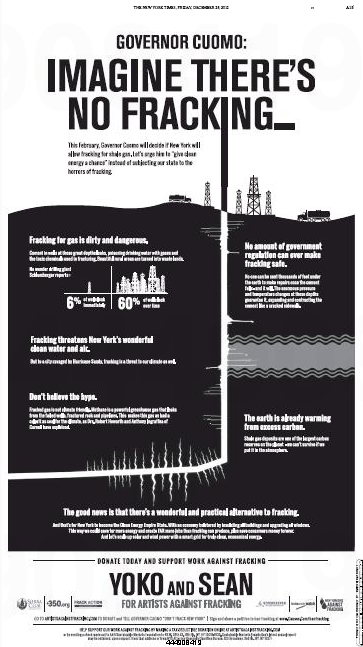 To be sure, the Yoko-industrial complex has inveighed against fracking before, specifically in a 2012 Times ad. Interestingly, that ad spotlighted the group Artists Against Fracking, which the current ad does not. Imagine having that kind of money. 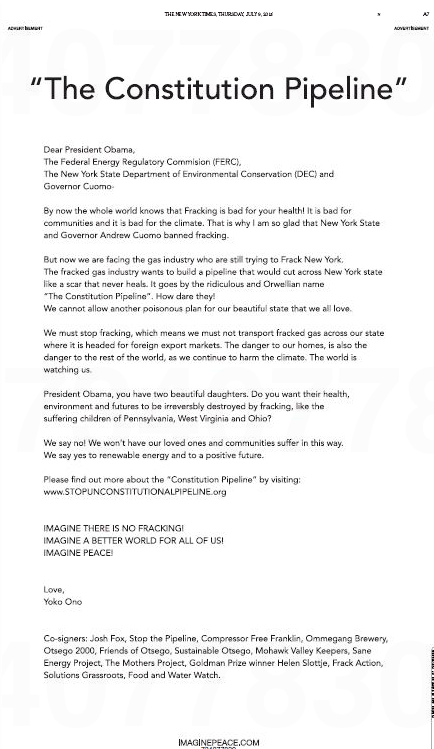 This entry was posted in Uncategorized and tagged Andrew Cuomo, Artists Against Fracking, Beatles disruptor, fracking, New York Times, StopUnconstitutionalPipeline.org, The Constitution Pipeline, Yoko Ono, Yoko-industrial complex. Bookmark the permalink. It’s either money or brains. And when you consider that it’s someone else’s money that she is using, it certainly can’t be brains. There should be a Constitutional Amendment to ban Yoko Onos. Isn’t the real reason for these ads, in many cases, to make the person or persons signing them (and sometimes paying for them) feel oh-so-good about themselves, regardless of actual impact it has, or what better uses the money could be put to? Call me cynical, can call me jaded, but that’s what I usually feel when I see these automatically disappearing monuments to one’s own wonderfulness and righteousness.